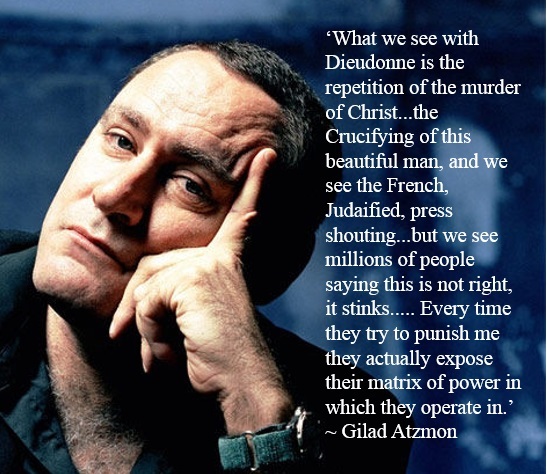 [2014 May] GILAD ATZMON ON DIEUDONNÉ, THE QUENELLE AND CHRIST KILLING "What we see with Dieudonne is the repetition of the murder of Christ...the Crucifying of this beautiful man, and we see the French, Judaified, press shouting...but we see millions of people saying this is not right, it stinks..... Every time they try to punish me they actually expose their matrix of power in which they operate in." 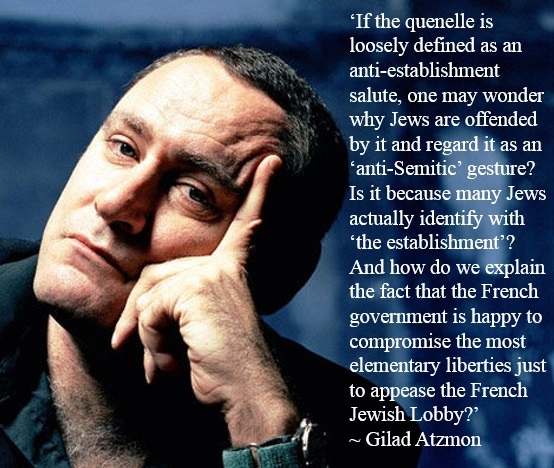 GILAD ATZMON ON DIEUDONNÉ AND THE QUENELLE If the quenelle is loosely defined as an anti establishment salute, one may wonder why Jews are offended by it and regard it as an ‘anti-Semitic’ gesture? Is it because many Jews actually identify with ‘the establishment’? And how do we explain the fact that the French government is happy to compromise the most elementary liberties just to appease the French Jewish Lobby (Crif)? Every Muslim, every black person and also any Jew must support Dieudonne, for this is the opposition to the most devastating form of oppression.